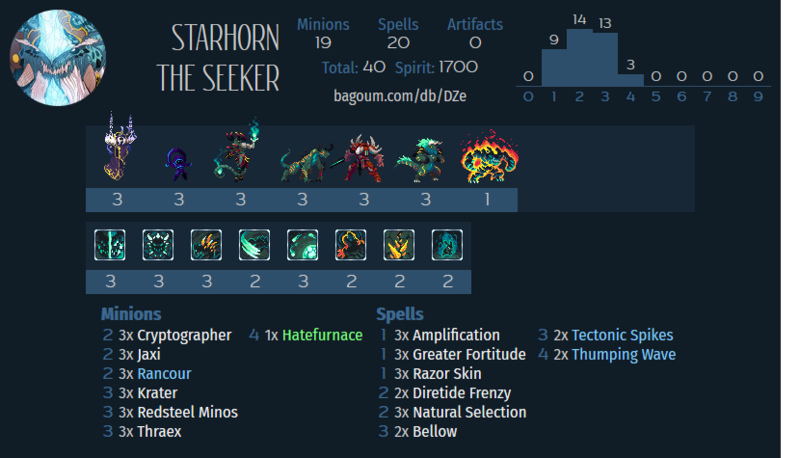 Given that 3 Decimus & 3 Spikes alone cost 3000 spirit I don’t feel it’d be a good idea to try and piece together that combo with basic cards just to have a ‘budget’ decihorn deck that would ultimately be pretty scuffed. Luckily there’s another deck that’s pretty specific to Starhorn that you can make a reasonable budget version of. That of course is Hatefurnace. To briefly explain why I titled the deck 2.5k spirit, but elsewhere the spirit cost is 1700 that is due to that fact that the lower cost does not include Hatefurnace itself, which can either be obtained for free or crafted for 1200 spirit (which you can then refund by disenchanting the prismatic version that you get in place of when you would have gotten it normally) so both numbers are sort of correct. As a result of the possibility that you may have spend an extra 1200 to ‘rent’ Hatefurnace I tried to ensure that this version was cheap enough to be going on with. Hatefurnace can honestly be surprisingly difficult to play, I think it’s because it’s quite all-in and maybe just a little bit weak anyway. You don’t have too many ways to answer enemy threats, and when you do you’re often diverging from progressing your own game plan, or at least slowing it down to be able to do so. Since you are putting multiple cards into one unit, and then drawing your enemy cards you sort of open yourself up to be blown out by good single target removal or dispel. If they pair that with some backline threat it can be a huge swing against you. Some decks though do have trouble answering large single targets, and if you do reach the trial then suddenly you are now able to answer everything and damage the enemy as the destiny is very strong indeed. Obvoiusly. We are building around this and though the trial does demand a lot you may find it hard to lose if you reach the turn after playing this as endless undercosted Makantors are quite good. Who knew? So when Hatefurnace was released a few clever people discovered that you didn’t just have to play ‘buff spells’, but any spell cast that resulted in a minion getting it’s attack buffed ticked up the trial. Therefore if you cast your BBS with Thraex, Minos, Vindicator or Visionar in play the trial goes up. CPG did a patch addressing this that increased the trial requirement, but this particular cool interaction is still usable, and now is almost mandatory if you want to complete the trial reasonably expediently. For our deck we’re including the cheap versions and none of the expensive ones, but they absolutely get the job done, so no worries there. Krater allows us some extra flexibility to deal with swarmy boards, artifact charges or just sometimes clean up surviving minions. The 1 face damage rarely matters either way, but can do, so eyes out for that. The other thing it does is enable Amplification, which is a conditional but powerful buff spell that significantly increases the durability of a unit, and increases it’s attack a fair bit too, so can make a really dangerous minion. As a 2 card combo it’s a 4/7, which is a pretty scary, but you can use amplification on anything damaged and create a real headache for the enemy. We unfortunately do not have the budget to run Vindicator (or Visionar) which both benefit from the ‘draw’ part of this card to tick up the trial and grow huge. Rancour However does progress the trial due to the self damage on Spikes causing it to increase in attack. Since Spikes is useful enough to include on it’s own for the refill and Rancour can sometimes go off I think it’s okay to include both of these as a pair, though Spike sis better when you add Vindicator. Rancour can also make for some cool plays post trial, deliberately hitting a large enemy with your general to reflect it back onto their general via Rancour feels pretty cool. The last minion in the list. It does have some anti-synergy with Krater & natural Selection in some aspects, but of the 2 drops available I like the Ranged. Maybe Vale Hunter would also be good in that aspect, but the dying Wish creating a new body means you have a good chance of having a target to play a buff onto. If you do get to start buffing this unanswered, well, any gauntlet player will tell you how Ranged can take over a game. The deck needs plenty of buff spells too in order to function. Here we have a smorgasbord of the better ones, depending on the situation. Fortitude is a good all rounder cheap and efficient. Razor Skin replaces itself, sometimes you can play out the battle pet but usually it ends up replaced, it’s cheap and scales with the number of minions you have out, but is usually quite a minor impact. Frenzy is real weak post trial, but can help by adding some AoE pre trial is jus generally acceptable. Bellow is cool when you get to stun important targets, particularly when you’re very close to trial complete, and the +3 attack is a fairly large amount. The removal of the deck. Since our deck is crammed with buffs you’d hope that Natural Selection will rarely be hitting our own minions. I think in a finalised version it may be a bit slow and clunky and just not quite in line enough with the gameplan. But it’s far from bad and has been seen in Magmar decklists over the years for a reason. Thumping Wave is more synergistic with the deck and gives us some conditionless transform removal that progresses the trial, you can also use it on your own minions when it makes sense to do so, so it’s quite flexible in that regard, which is a very nice property of a card. My feeling is that Vindicator is the most important one to mention here, as it triggers off a BBS, but any other draw spells like Spikes and just generally gets huge very quickly. Visionar also has this property, but is a little slower. Kujata is also a good call for speeding up the deck and as another way to turn on Amplification.